Two Beaman families enjoyed Mexican fare at Chuy’s, a Fifties-themed restaurant where patrons can observe hand-rolled tortillas being tossed in air and prepared for the table. When our orders were delivered, we stuffed ourselves with tacos, enchiladas, and burritos. Curtis gobbled up his combination platter in minutes and wanted more. He’s fourteen now with a stomach that’s a bottomless pit. “I’m sorry. We’re out of flan, but we have cakes and ice creams,” His face fell. I felt his disappointment. 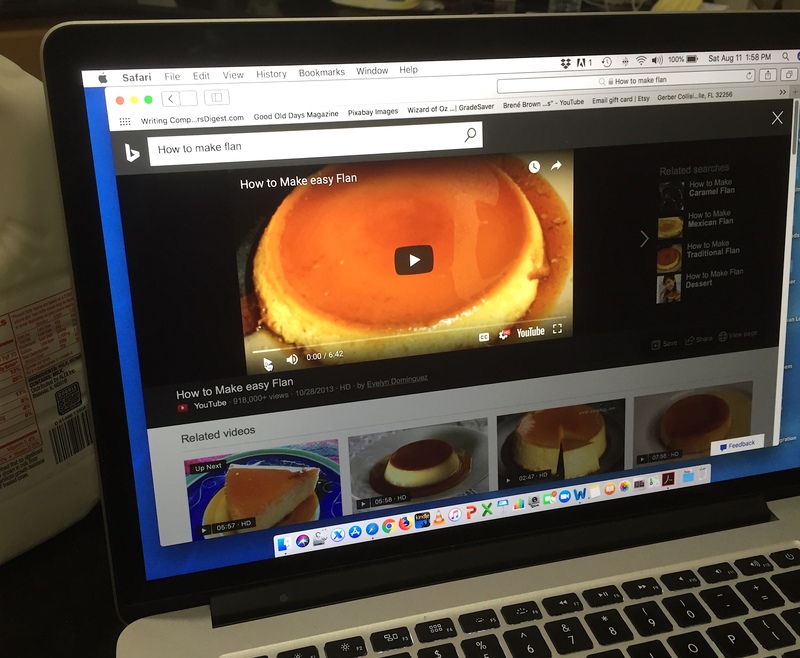 “How about we make flan sometime before school starts?” offering my clueless stab at a solution. “Okay, let’s do that!” he nodded, grinning. Curtis and I have worked in the kitchen before. He’s not an ingénue. Previously, he didn’t shy from wearing one of my aprons for the job, his torso way too small then for Grandpa’s denim. I wrote about our first attempt as a duo in Do Real Men Wear Aprons? several years ago in a different kitchen. 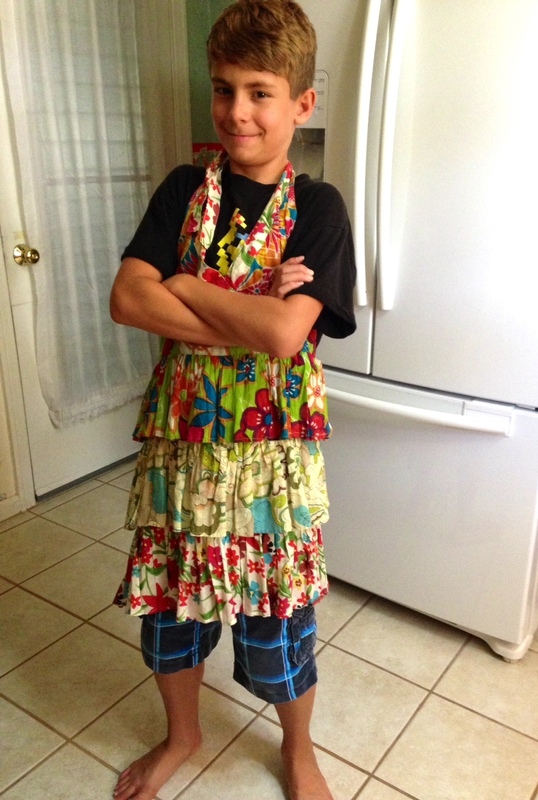 His apron for flan making was Grandpa’s denim, not Nana’s flowery outfit. From the beginning Curtis took charge – I’m not in the pictures much, except for reading the recipe and initiating the video. He is almost my height now with more pronounced muscles, a bass voice, and a shock of thick hair, a teenage waterfall. Oh, I did assemble the ingredients. 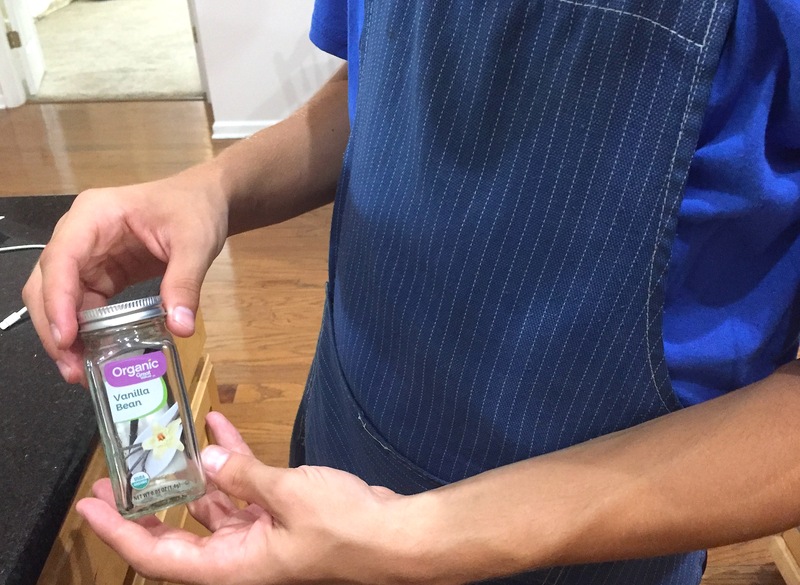 For the first time ever, we cooked with a real vanilla bean, a .05 organic bean costing a small fortune, even from Walmart. No wonder! Such beans are imported from Madagascar, Uganda, or Tahiti. I wonder if vanilla plants would grow in Northeast Florida; we’d be rich! And growing such an exotic plant would be less risky than growing a weed, like, say, marijuana. Curtis carefully extracted seeds from the imported bean, the strays collected in a sieve. 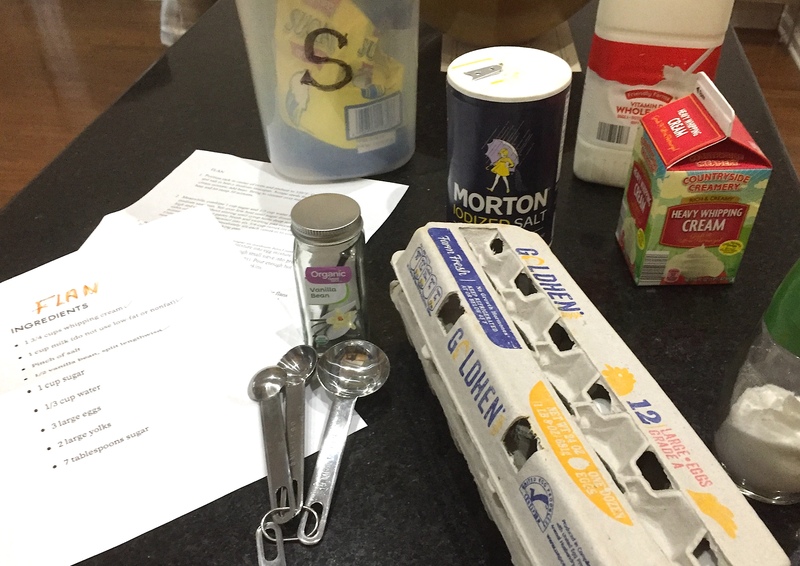 The kitchen was a flurry of activity ~ cracking eggs, measuring dry ingredients, simmering . . .
Discovering, too late, that the internet flan recipe mingles the ingredients for the two distinct parts of a flan recipe: the custard and the caramel glaze. Even after the sugar water mixture reached “amber” color, and we pulled the pan off the stove, the declining heat turned the mixture to an unwelcome rusty color. Thereupon followed a kerfuffle of scraping, reheating, hoping to salvage the recipe! Then we realized that the caramel mixture should have gone on the bottom of the pan, the custard part on top. Our project turned into an upside down affair because we assembled the project backwards. Like a pineapple upside-down cake, we should have been able to slide the flan out of the pan and plated it, bottoms up. Oy! 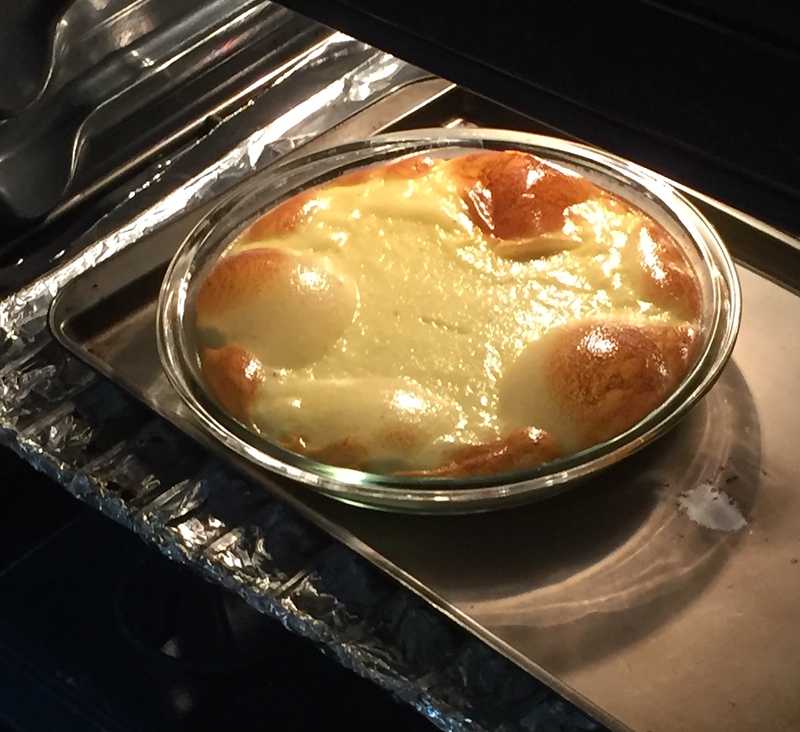 The custard looked healthy (sort of) as we pulled it from the oven. Should it look bubbly? we wondered. We drizzled what caramel we could salvage onto the top of the custard in ramekins. It didn’t look half bad. 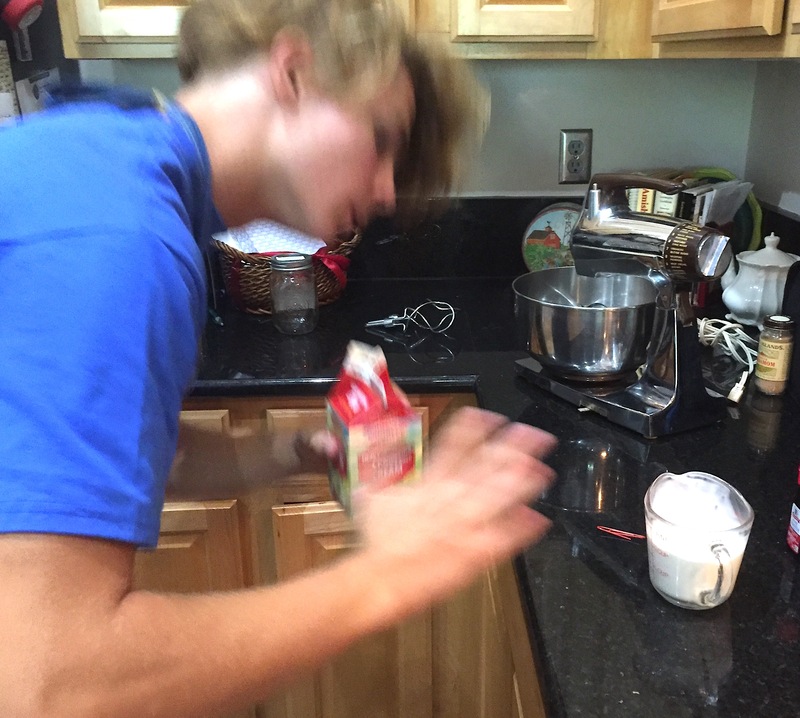 Curtis’ face registers the trial-and-error frustration of our first attempt at flan making. He admitted it did taste good though. His Grandpa B. agreed! My blog friend L. Marie tried to make Yarny, a new project for her. She agrees she had mixed results, but she enjoyed nosing out of her word-y comfort zone to experiment with yarn. What is the last new thing you tried? How did it turn out? Comments on my trial and error recipe with Curtis? My first thought when I read you were going to make flan was, “Oh, that’s more difficult than it sounds.” Flan is one of those simple things that can go badly wrong. Lessons learned though. Next time. There were “holes” in the internet recipe. I should have paid more attention to the video that clearly showed the process if not the ingredient amounts. At least, we didn’t have to hold our breaths trying to execute a flawless “flip” from pan to plate, Yes, lessons learned – ha! Your “pantser” approach to drafting obviously works better than the “plotter” method that goes against your grain. I guess you’ll have to stick with what works. I admire right-brained folks like you, who write from the heart, intuitively. Thanks for reading and commenting as always, Jill! Thanks, Marian. I’ve tried to plot…but it’s not as fun. 🙂 Happy Writing! And of course, some great memories! Custard and caramel sauce indeed! And the way we mixed it in the end tasted quite good. I think Curtis wanted to quit when the caramel turned too dark, but in spite of some shaky moments we ended up with an edible dessert. You create in the kitchen all the time and know first hand how things can go wrong. Thanks, Merril! I think flan is very popular in Hispanic households. A colleague who taught Spanish introduced me to the dessert when we had a faculty get together. Thanks for the compliment ~ and the comment, Darlene! Wonderful story, Marian, as always! Thank you for being a constant reader here. It’s good to have you cheering me on in these posts, Jack! Sounds like your Plan “A” went to Plan “B” that worked out beautifully. Time well spent with a growing grandson. I try to keep your idea of “always having a Plan B” in my line of sight. Yes, grandson is learning another lesson in how things do not always go as planned! I enjoy watching Curtis use his culinary skills along with his sweaty weekend job of mowing and trimming our yard during growing season. 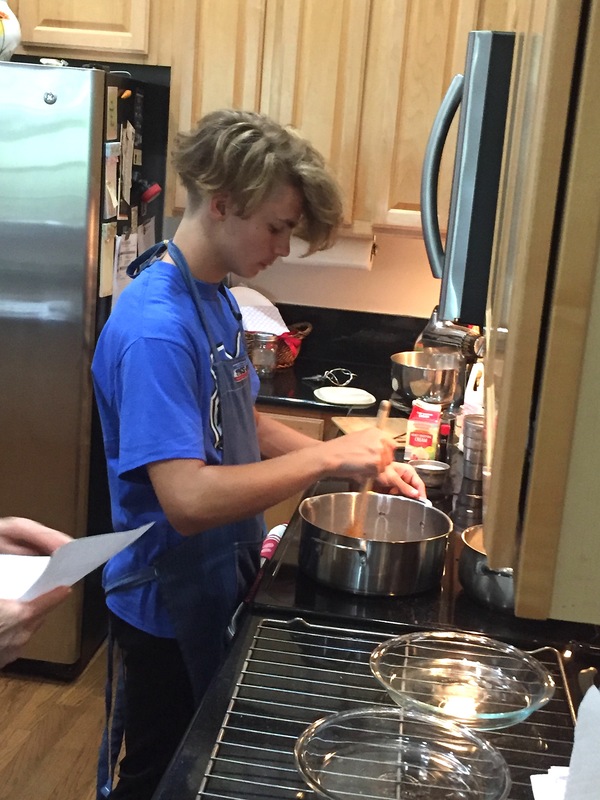 Outside and in the kitchen, Curtis is learning lessons, including a solid work ethic. Thanks for supporting his learning on the lawn, Grandpa! You could always count down on the sugar. I do it all the time when baking. 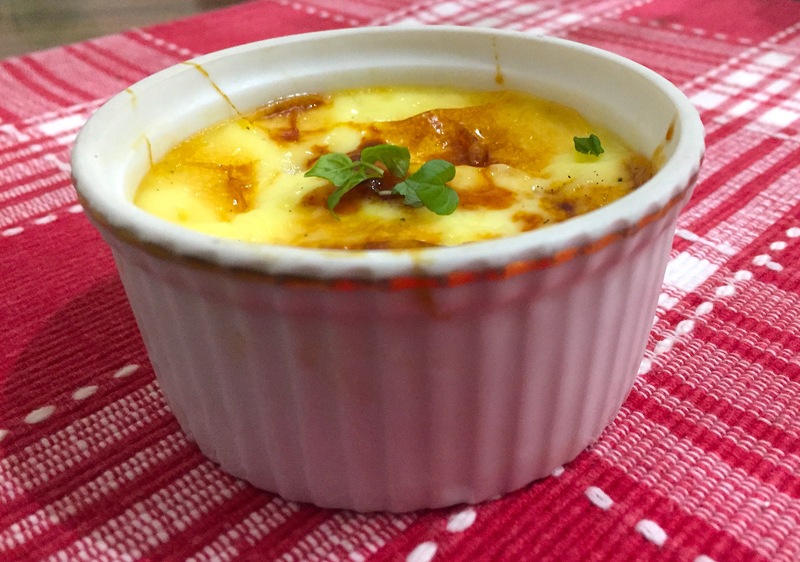 Crême Brulée is gorgeous too and easier to make. I wonder if imbibing a shot of brandy contributed to the “blooming marvelous” outcome. Ha! You should be proud of your fish soup efforts. Tabasco adds a pop of tartness to many recipes. You are adventuresome, Susan. And not just in the kitchen. Thanks for commenting! Great story as always! Thanks for sharing. What a lovely soral to the morey, Marian. Loved that! And loved how you noted each step along the way, no matter what happened. What a lucky grandson. You’ll have to try quiche next. However, as to the “And growing such an exotic plant would be less risky than growing a weed, like, say, marijuana.” I can only say — hemp is where it’s at these days. Just like Colonial times. In France they are using hemp fibers to grow houses! Though, I wonder if Florida may not get cold enough? I think I’ll stay way from marijuana, a little risky with teenagers around. Florida’s not cold enough: I’ll let it go at that, Janet! Well, if ever you should change your mind, Marian 🙂 be sure to keep in mind that growing pot is different from growing hemp. Different plant, for one thing. Yes, up here in VT hemp is catching on in a big way; I’m starting to see bio products (seeds and oil) at the local coops. Better than flax seeds even. Cheers. And yes, I would Welcome a post on quiche. You are a With-It, in the Know! Cannabis Oil (CDB) is a big thing now, touted as a medical fixer, a good thing. The quiche post will have to wait. 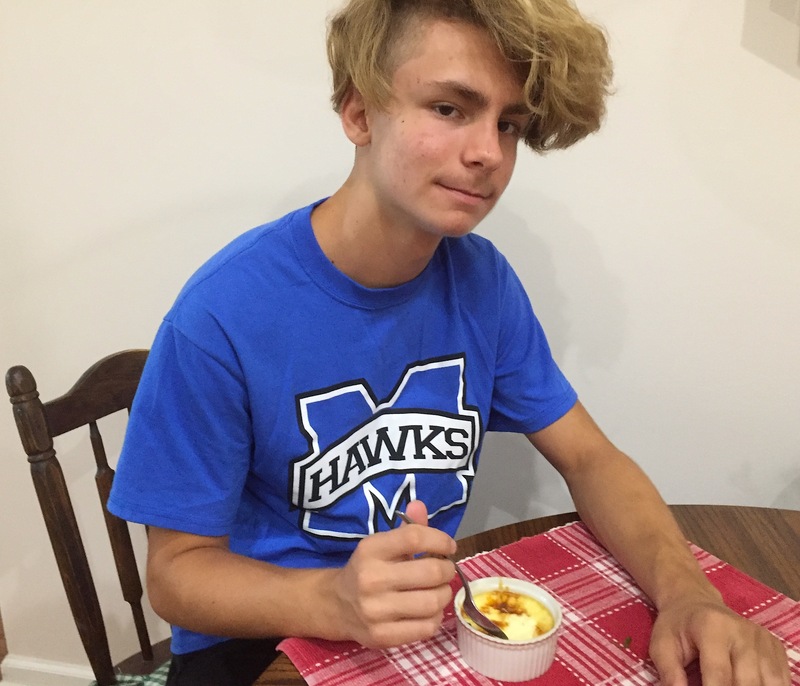 Curtis is back in school in the IB program and involved in cross-country runs before and after classes. Thanks for checking in again, Janet! How fun! 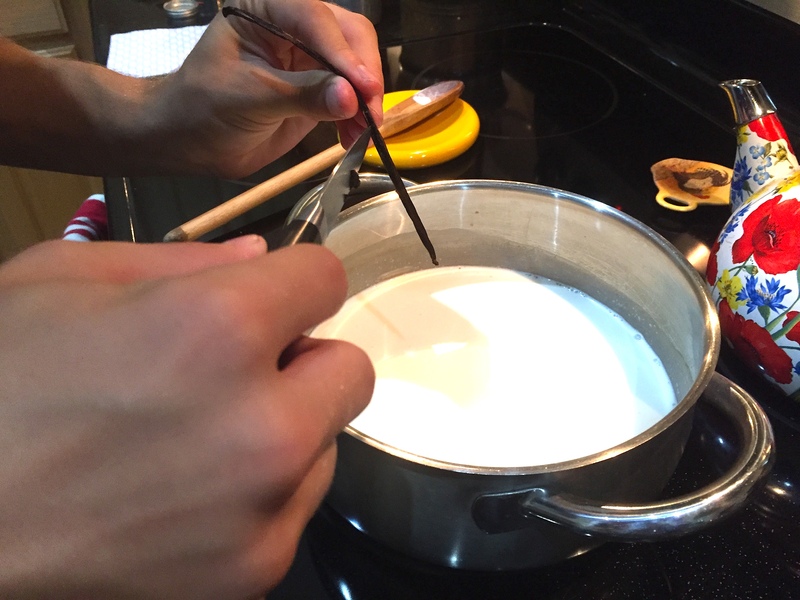 I love making, experimenting, tasting new recipes with my grandchildren! I really enjoyed reading this and almost felt I was there in the kitchen with you!!! Thanks for sharing with us! You are welcome. Maybe a blog post with one of your grandchildren in the kitchen is in the offing, Anita. I sense that you may be a more seasoned cook than I. I don’t bake very much because of the Florida heat. That’s my excuse anyway. But I do like to cook, a nice break from writing. Your trial and error story is so entertaining, Marian. I’m sorry your flan experiment had mixed results. But you gave it a good try. I have noticed these internet recipes sometimes leave out key steps. I’m glad your flan tasted good, however. Do you think you’ll try again? Trial and error is a great way to describe our experiment. I think we’ll try a different recipe next time, since we would find it more challenging than a recipe that’s a little too sweet. I’m happy to share your post. My art therapist daughter in law may try a version of this with clients in her studio. Learning the hard way shows vulnerability, L. Marie, not a bad trait for bloggers. Marian — That was quite a kitchen adventure! I enjoyed the supporting photographs. Gosh, but Curtis has grown up! Our most recent “new thing we tried” was returning to Boise from Missoula, MT via a different route. We decided that because there’s no snow/ice at this time, let’s take the jiggity-jaggety mountain route. Not only were there lumber trucks galore (barreling on skinny two-lane roads), the sheer dropoff cliffs were enough to skyrocket adrenaline levels. When we try new, scary things we expand ourselves but also learn our limits. Yes? I remember on our my trip to the West, our driver had to negotiate hairpin curves on a mountain road (Beartooth Cross?) that had NO guardrails. It was terrifying! Thanks for expanding our discussion beyond recipes, Laurie! We have a grandson who turns 18 today, and we have seen the changes in him, which are quite remarkable. He changed from a placid, easy going type with a sweet smile to a somewhat surly introvert. Having raised three teens I assured my daughter that he would be fine, and things are changing for the better. He graduated high school with a nice scholarship, has been accepted at a university where he’ll be studying communications, and is returning to his relaxed self! It’s almost like watching a cocoon become a butterfly! The oral of the mory: This too will pass! I like your oral of the mory, Elfrieda! Our older grandsons are only 14 and I’ve noticed some causes for concern too, which I think can be attributed to hormone levels. Hi, Marian—once again, I enjoyed reading! Relaxing with a cup of tea after taking my youngest son out for his birthday lunch. Enjoy the holiday weekend! I wonder if your son lives close by. Either way, it’s nice to share a milestone and make a memory. Have a great holiday weekend too, Tracy! He’s an hour away now. Much closer than the 22-Hours that separated us when I lived in New England! It’s the adventure of trying new things that is so wonderful. Sometimes it works, other times it doesn’t but there is always new learning involved, especially in the kitchen. I’ve baked many disasters in my life. I used to make flan from a Julia Child recipe which was delicious, but it’s complicated and even when it isn’t perfect it’s the taste that satisfies me. 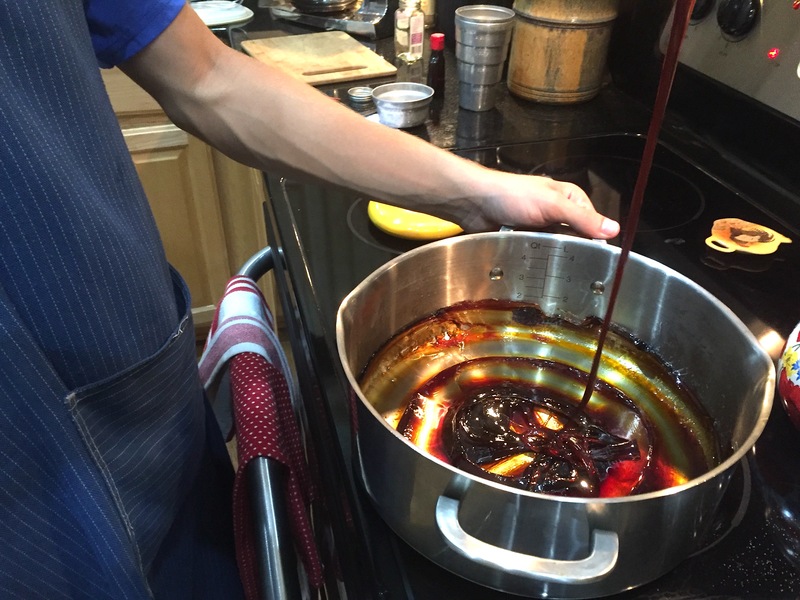 Your Julia Child recipe probably lays out the steps in precise order. Looking back, I think my recipe mingled the steps for the custard and the caramel sauce; similar ingredients (like sugar) were used in each. As a great menu designer and cook, your endorsement means a lot, Carol. Two other grands like to create in the kitchen too. Jenna and Patrick both like baking cookies and fixing hors d’oeuvres. I enjoyed this blog post! It sounds like Curtis has the soul of a chef. PS: Maybe next time you two could make Crème Brûlée; it’s similar but easier. I’ve thought of that, and you are confirming it. I think you can use a kitchen blow torch to finish it off. Curtis would love that! I’ll check to see if he’s interested. By the way, one of my friends who took a cooking class mentioned that the chef used a blow torch for peppers, the effect sort of like grilling, but faster. Thanks, Lynn! If that flan tasted good then it really wasn’t a flop! Well done. You’re the first one to say that. And you are absolutely right, Fiona! In the end, it did taste good. All’s well that ends well, so the saying goes. Thanks for the thumbs up. Smiling. Laughing, Groaning for you two. And in the end, feeling enlightened with your last quote. 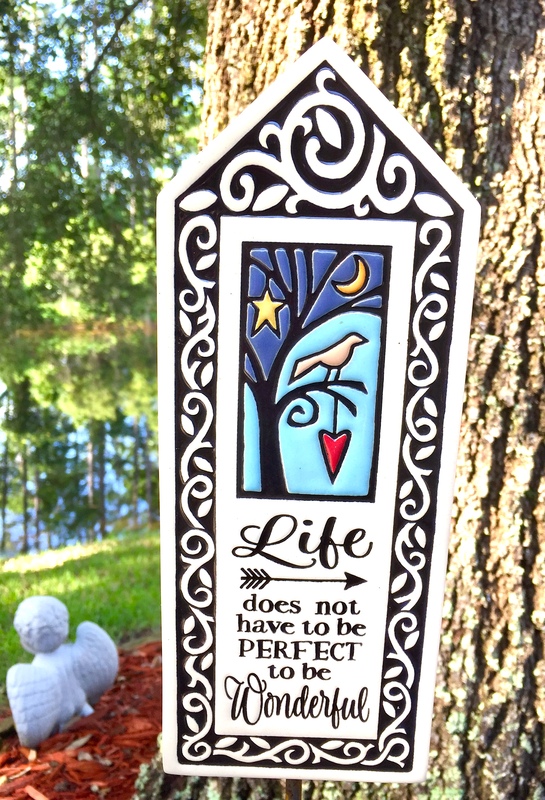 So so true: I think the LACK of perfection is what makes life so very grand. I’ll put Mexico right up there beside Madagascar as a source, Debby. I wonder if you’ve used the “raw” bean in recipes. This was my first try ever. Vanilla extract has always been my go-to, but it seemed important to be organic this time. Thanks! Such a young man now your grandson I can barely recognise him . It all looked like it was going well but how did it taste that’ s what I’d like to know . It tasted GREAT! Curtis took some home with him. We had what was left, and I can truthfully say I could have eaten more. Taste buds and stomach don’t know whether the recipe was made upside and backwards . . . or not. Hugs to you too, Cherry! So much fun cooking with your grandkids and celebrating the successes and flops–although in the end, this looked successful to me. Next time will be easier and you know what to make Curtis for his birthday. Maybe he’ll want to try making flan a second time with you doing the video and writing the food blog. Sounds like a plan. Thanks for sharing family joys and laughs. I like your plan, Elaine. We’ll see. 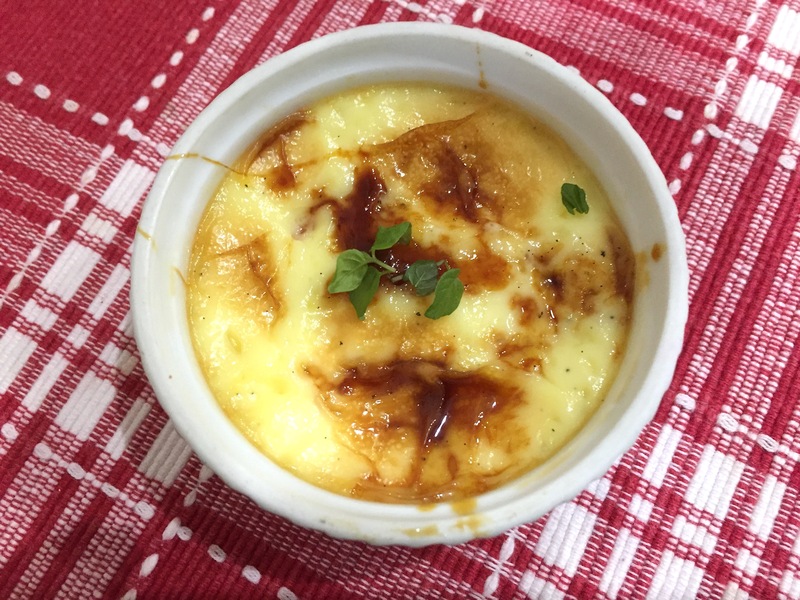 Since then, we’ve talked about using a kitchen torch to make something else, maybe creme brûlée, very similar to flan. Someone else has suggested torching bell peppers, a quick way to grill. I know we’d both like playing with fire whatever the recipe – ha! This is funny. I’ve made many a goof in the kitchen so it rings true with me. I like that you repurposed your final product in such a way as to create that which you were trying to make to begin with. Good enough is often just fine.